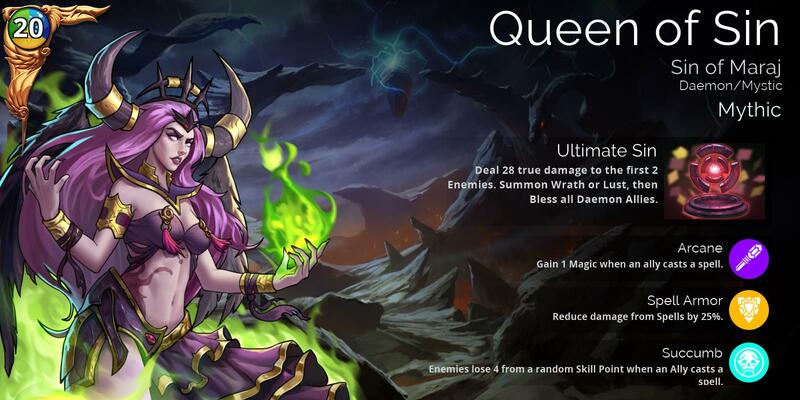 Queen of Sin will be the only Mythic Troop available in Glory, Gem, Guild & VIP Chests for the next 7 days. Question: Does kingdom mythic drop from event keys ...? Good Luck my boys 600 Glory keys , now i must sin! Don’t, I spent 4000 glory keys and 20k seals and 10 vip. i was mistaken i thought her trait meant tobtrgger on 4 or 5 matches, and its on ally cast. yeah, plague is the one on 4/5 match. “Enemies lose skill points” gets worse and worse the more we spend time on scaling events. How long do games last today, on average? 8-10 turns at higher level matches? I can’t see surviving that much longer without a gimmick team that couldn’t have QoS on it. I’m looking at Zuul’goth level 225 right now. It has 51 magic and 127 attack. If I don’t kill it in less than about 10 turns, it’s going to instakill one of my troops. In 10 turns, I’m going to eat 40 of his stat points. That sounds amazing! But it’s 40 random stat points. So I’ll on average eat 8 from each. It still has more than 440 total health, 119 attack, and an irrelevant ~40 magic. It’s still going to kill one of my troops, then poison and freeze the rest. Even if I hit Magic all 10 turns, that happens. If I lucksack into any other stat, it’s just as irrelevant. 28 True Damage is equally underwhelming, even with Arcane boosting it. Damage in excess of 50 per troop in an easily-created scenario like “burning enemies”. She’s none of these. There’s probably a True Damage team to be made here, and in midgame she’s probably got a team that will make someone happy she’s their first mythic. But it’s “a mythic” with “some potential” and not worth going bankrupt over if your first attempts are fruitless. I’ve used up everything i had and nothing, on top of that, to make things more funny AFTER i’ve used up all that new osom pop up appear tellimg me for a week there that exclusive mythic bla bla. Thx! had no clue about that rofl (and if is meant as i can buy crapload of gems to dump into 0,00000002% chests keep dreaming :3)! Wow some really cheap drops here for Queen of Sin. Monthly thread? quite often on forum and tbh hardly seen any. But yes, let’s see, 1k+ gems keys, 20k+ guild seal, 2k+ glory keys (kept 5k glory for next week troop). There’s normally at least 1 thread of this type on first weekend of the month when new Mythic releases. The cost you have listed is what I would normally expect for myself to get it, I get home from work in about 2 hours and I will see how it goes then. But yes you’re right, if you’re not in a guild that helps earn lots of resources then you can’t expect to get the new mythic every month. Unfortunately some people do expect to play the game for a month and suddenly get all the top end troops. Anyway, it doesn’t really matter so much, because errrm, ‘there’s the forge’ lol. 2,400 Glory Keys, 10,000 Seals, and 350 Gem Keys later I didn’t get one copy. I’ll be spending whatever keys I get until next Friday but not dumping a single Gem on her, worse case I’ll buy her with Diamonds later. She’s not worth exhausting my Gem cache. Hence why i say to anyone ever thinking about starting this game, “is a better idea take that mace and bash your own…”. One thing that ppls expect in ANY game defo isnt get left behind more and more with time, more likely the opposite, be able to catch up in some way. Forge is yes useful to get the GOOD ones, but defo is totally worthless for anything else, on the “brag screenshot” i seen here what was the most diamonds? 20k i think? wow, that are enough for a whopping 5 mythics (and anyway those are ppls that play from like day 1 or so too?). How many mythics there are in game? 37 and 1 get added each month. Thx god there’s the crappy ones too (for example i dont have gargantuar, not planning to craft him either, like, ever too) and mediocre ones (like THAT ONE) you can live without and not really worth bothering about thinking to craft them either. Ofc if someone is also a completionist that’s another whole matter, a completionist that plan to start this game is just a masochist imo. Memory serves, as you and I, both on Xbox One, expended a LOT of resources for the Mythic Mech last month. This time around, I, too, acquired the Queen with only Glory Keys… though, it did cost me 1,750. But, I’m totally good with that. I mean, they’re glory keys, right? 1000 guild seals to get mine. Super lucky, and have a bunch of keys to burn next weekend when mythics are back in chests. 11 guild keys, 500 gem keys then dropped from 2k glory keys! !